Woodrow Wilson died in 1924, but he is still making headlines. 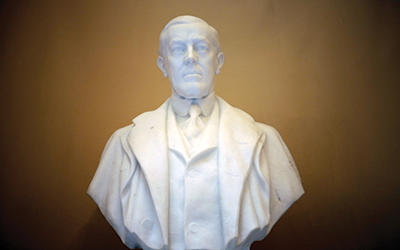 Woodrow Wilson’s bust sits in a niche in the state Capitol Rotunda, a place that honors eight Virginia-born presidents. He guided the nation through World War I and won the Nobel Peace Prize as the architect of the League of Nations. Nonetheless, today, more than 90 years after his death, Wilson is portrayed as a villain by critics on the left and right. Meanwhile, talk show host Glenn Beck has described Wilson, a Democrat, as the “president you need to hate” because of his seminal role in American progressivism, the movement that conservatives blame for the creation of big government. So how does a long-dead president provoke such passion? Wilson’s life story has not changed, but attitudes about his legacy have shifted because of recent events. Princeton’s Woodrow Wilson School of Public and International Affairs has borne his name since 1930. The Black Justice League, however, believes honoring the former president is disgraceful because of his racism. The sit-in occurred during a wave of protests last year drawing attention to racial issues on campuses across the country. On the other hand, Beck’s attacks on Wilson coincided with the rise of the tea party, which has pushed back against government spending and health-care reform. In searching history for the big bang of big government, Beck and other conservatives have settled upon Wilson, whose legislative agenda transformed the relationship between government and business. Both sides have evidence to support their claims, but they miss the big picture. That’s the danger of interpreting history on the basis of today’s headlines. Despite his reputation as a reformer, Wilson was no progressive on race relations. In 1896, the Supreme Court had decided that “separate but equal” public accommodations based on race were constitutional. That decision would stand until 1954. The president also famously held a White House screening of “Birth of a Nation,” the 1915 D.W. Griffith film that helped spark a 20th-century revival of the Ku Klux Klan. Nonetheless, Jonathan Zimmerman, a New York University professor, says Wilson’s legislative agenda unleashed the power of the federal government to aid the poor and dispossessed. In establishing the Federal Reserve System, Federal Trade Commission, a national income tax and other programs, Wilson established a template that was used by his former assistant secretary of the Navy, Franklin Roosevelt, in implementing the New Deal in 1933. In turn, an FDR protégé, Lyndon Johnson, would spearhead civil rights reform in the 1960s. In an article posted on the website Politico soon after the Princeton sit-in, Zimmerman wrote that African-Americans now vote overwhelmingly for Democrats because they believe their circumstances would be much worse without federal programs and protections. That might sound like an indictment to Beck, but Wilson actually was not the first progressive to occupy the White House. Theodore Roosevelt’s Square Deal (1901-09) included breaking up business trusts, regulating railroads, creating national parks and establishing purity standards for food and drugs. In fact, Roosevelt, a Republican, ran for president again in 1912 because he thought his handpicked successor, William Howard Taft, had failed to maintain the Square Deal’s momentum. Rebuffed for the GOP nomination, Roosevelt stalked out of the convention and began his own campaign, under the Progressive Party banner. As a result, there were four candidates for president on the 1912 ballot, Roosevelt, Taft, Wilson and Socialist Eugene Debs. Wilson won the election with 41.8 percent of the vote, carrying 40 states. Roosevelt was second with 27.4 percent and six states, while the incumbent, Taft, finished third with 23.2 percent and carrying only two states. Debs won 6 percent of the vote. With two progressives and a Socialist garnering nearly 77 percent of the vote, the public was obviously in the mood for change in 1912. Wilson was ready to comply. Four years later, Wilson successfully ran for re-election against Republican Charles Evans Hughes, a bearded former governor of New York who also had a progressive record. Roosevelt quipped that the only difference between Hughes and Wilson was a shave.